Last week we were able to attend a special The Moms event, where we got to see a special screening of Disney Pixars - The Good Dinosaur and check out some of the latest designs from Okie Dokie for JcPenny which featured our favorite characters from the movie. 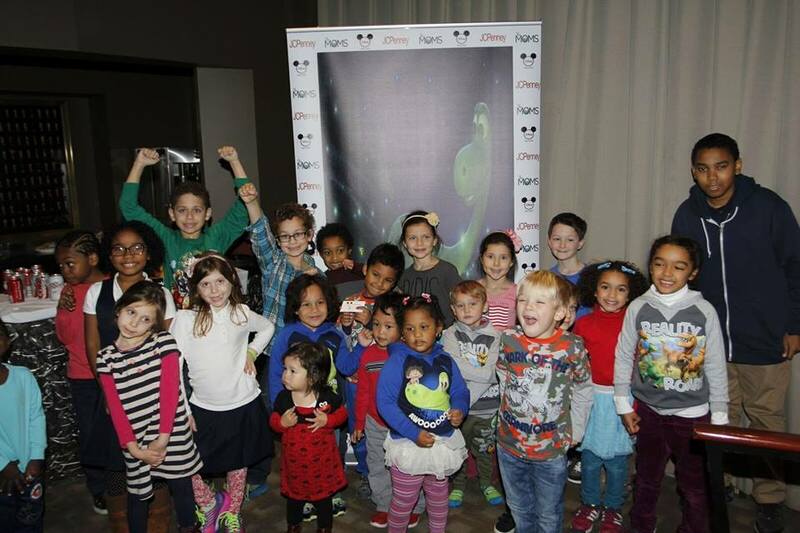 Just look at all the cute little kids that attended, can you spy Valentina? She's the tiniest one of all and looking at me to the far side of the stage. I'm not sure if she was hot and wanted to take off her Elmo dress or she just wanted to put on all the cute Okie Dokie clothes. We arrived about half an hour early in order to be able to check out the clothes on site and to have a little fun modeling and trying them out. You can see from the above picture that Valentina went straight for the Disney Okie Dokie Tutu skirts, I don't blame her. They are so soft and perfect for twirling, and if you look closely enough at this picture you will notice that her eyes are a little bit red and swollen! The reason? She didn't want to take off the tutu skirt. On the other side of the picture you can see some of the other pieces available from Okie Dokie for JcPenny. It was so hard to pick just one item, they are all perfect for trotting around the city that never sleeps. 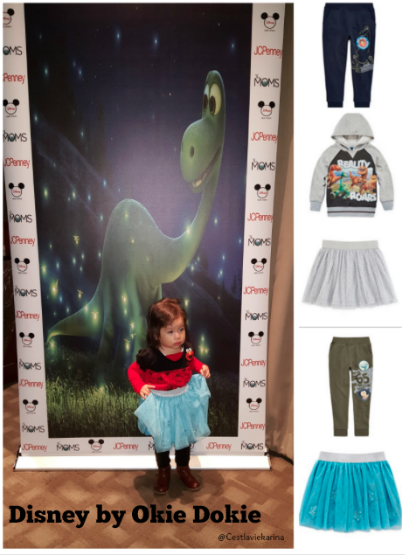 Especially with this cold weather, the pants are soft sweats lined with fleece and they feature our favorite characters from The Good Dinosaur. Playful and fun clothes, that's unisex. 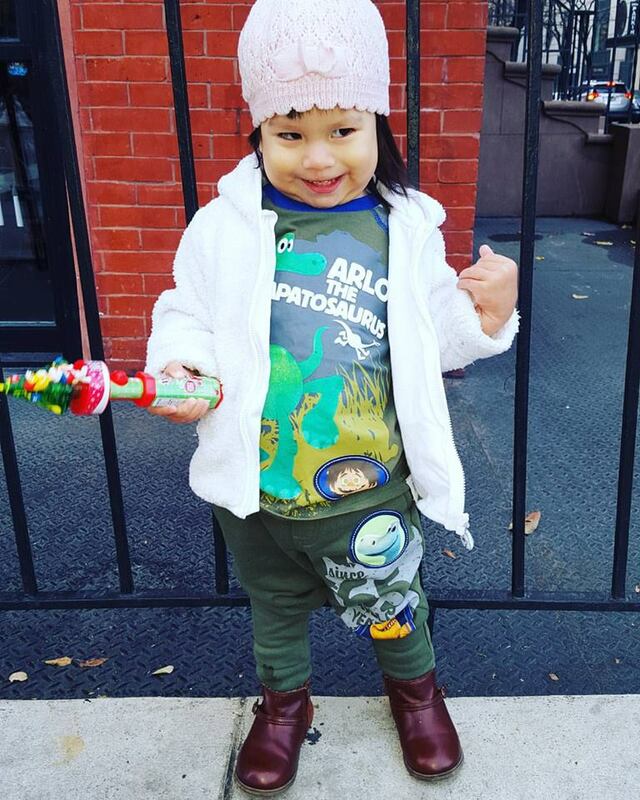 Just look at Valentina rocking her Okie Dokie for JcPenny top and pants like a total rockstar! Who said dinosaurs were only for boys? Plus this outfit made our jellybean just a little more sassy! The sizing runs true to size in my opinion. Valentina will be 2 in February and she is wearing size 2T in both top and bottom, we could really wear a size 3T because she is tall for her age. Both top and bottom are very comfortable and cute, it was hard to take off once we got home. This girl wanted to sleep in her Okie Dokie clothes. 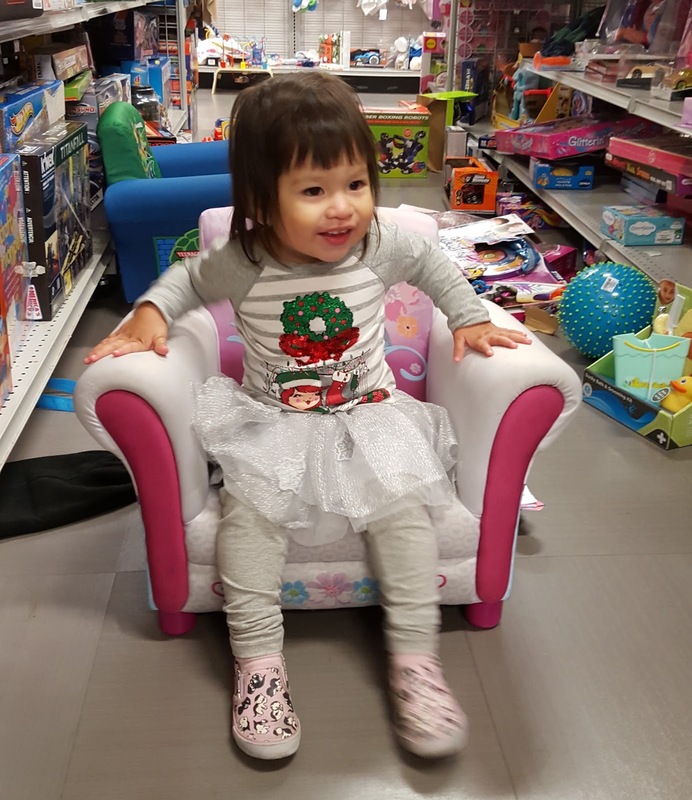 Here she is wearing her Disney by Okie Dokie tutu skirt at the toy store. She loves her tutu available here, tutu skirt is also on sale and Valentina is wearing a size 2 here. So make sure to check out JCPenny online and search Okie Dokie or go to your closest JcPenny and check the line out in person. You won't regret it, we are already planning to wear that dinosaur top with the tutu skirt next. Remember that you can follow us on Instagram for more pictures and for our adventures you can can also check us out on YouTube! Now for the movie The Good Dinosaur make sure to take a box of tissues with you, it will make you cry a few times throughout the movie. 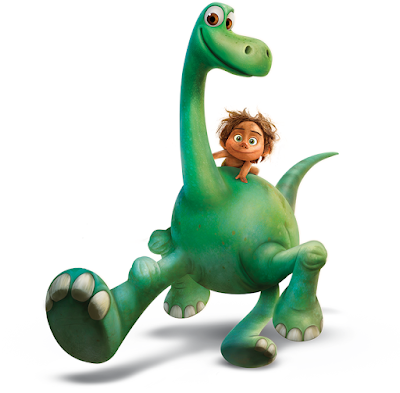 You and your kids will fall in love with Arlo & Spot. Can you guess who's Arlo and who's Spot? You will have to see the movie to find out. I'd read some reviews about it being a little scary for younger kids but Valentina didn't get scared once and didn't cry. She loved the movie and watched the entire movie, during the sad parts she would just say something and keep watching. The only time she got scared was with the mini cartoon that they show before the movie begins, aside form the she as fine. For the older kids it holds a special message. One of love for your family and getting over your fears. Pixar & Disney do it again. Make sure to see this movie during the holiday season with your family. Disclaimer: I was not compensated for this post. I was invited to attend the Okie Dokie by JCPenny The Moms event and received an item for attending the event. All words and opinions expressed are 100% my own.